Charlton, Schaefer Debate Before 150 — The candidates seeking to replace Bill Adolph for the 165th District Seat in the Pennsylvania State House debated tonight (Oct. 18) before an audience of about 150 at the Springfield Township Building. The lawn of the Springfield Township Building before tonight’s debate. Alex Charlton of Springfield, the Republican, emphasized many times that Pennsylvania has a spending problem not one of revenue. “It’s not that we tax enough but that we spend too much,” he said. Elaine Schaefer of Radnor, the Democrat, pushed over and over an extraction tax on natural gas, and forcing more revenue from corporations as budget solutions. Both supported more education spending. Charlton noted that he had three daughters. Both supported greater government transparency. Charlton especially defended the Open Records Office and condemned Gov. Wolf’s attempt to politicize it last year. Shaefer said she opposed privatizing the state-owned liquor stores because Pennsylvania would lose revenue. Charlton supported liquor privatization and noted that most of the revenue would remain as it comes from taxes which would be unchanged. He also noted that Pennsylvania would get money from the sale of the liquor stores. Shaefer strongly defended Gov. Wolf’s plan to resettle a massive number of Syrian refugees in the state. She cited the benefits of diversity. She said that until someone is identified as a “bad actor” we must assume he is not. Charlton thought Wolf’s plan was foolish. “We need to put the needs of our citizens first,” he said. Schaefer rabidly defended Planned Parenthood and unrestricted abortion. Charlton noted that Planned Parenthood was a billion dollar corporation but that defunding it was not on his agenda. Rather, his emphasis would be on health care for pregnant women. He noted that as long as Roe v Wade was in effect it was difficult to address abortion legislatively. Schaefer attacked the National Rifle Association and condemned legislation that allowed municipalities to be sued if they enacted gun laws that went beyond what the state had enacted. Charlton pointed out that a state-wide patchwork of gun laws would cause turmoil and that a gun owner should have an expectation of consistency when moving around the state. Both candidates said open space was important to a community. Schaefer took issue with Charlton’s suggestion last summer that the Philadelphia Archdiocese donate the Don Guanella tract in Marple that is up for development. She said the acquisition of open space is a long, complicated process. Charlton noted that he has met with the Archdiocese, that they were not offended and that the matter is advancing. In response to a question regarding the recent state Supreme Court ruling that the “local share assessment” provision in the state gambling code unfairly burdened some casinos, Charlton said it was critical that Chester City and Delaware County not lose the money that they had been getting from Harrah’s in Chester, and that he expected the legislature to have the matter addressed before the winner of this election took office. Schaefer said she wanted to tax drilling in the Marcellus Shale. The debate was sponsored by the League of Women Voters and was videorecorded by John Haines Sr of Off Net TV. It should be available at his YouTube channel here. Or one can contact him for information, anyway. 165th Legislative District Debate Tonight — The candidates for the 165th Pennsylvania Legislative District seat will debate 7:30 tonight, Oct. 18, at the Springfield Township Building, 50 Powell Road, Springfield, PA 19064. 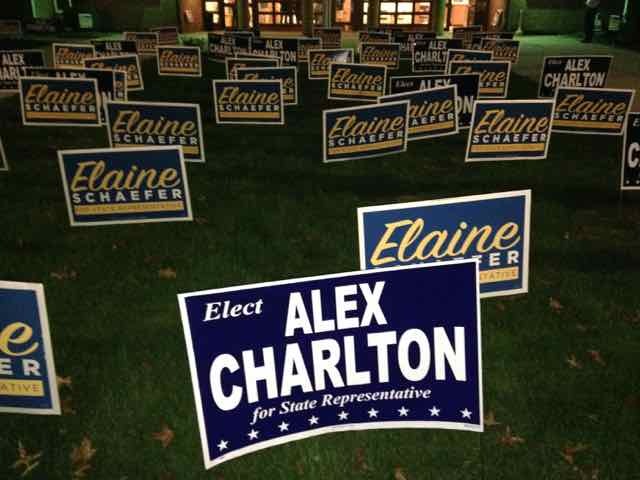 On the ballot are Republican Alex Charlton and Democrat Elaine Schaefer. The seat had been held by Bill Adolph since 1988. The district consists of Springfield Township, except for part of the 2nd Division in the 3rd Ward; Morton Borough; Marple Township, except for the 5th Ward; and the 4th and 6th wards of Radnor Township along with the 1st Division of the 1st Ward, the 1st Division of the 3rd Ward, and the 2nd Division of the 5th Ward. As of the 2011 redistricting it had a population of 63,769. Elaine Schaefer Broken Window Politics. Elaine Schaefer Broken Window Politics. — Radnor Commissioner Elaine Schaefer is the Democrat seeking to fill the 165th Pennsylvania House seat being vacated by Bill Adolph who has held it since 1988. Commissioner Elaine Schaefer with Superintendent William Colarulo and her campaign manager, Devin Gosnell, at the Springfield National Night Out event on Aug. 2. Trying to keep it in Republican hands is Alex Charlton. 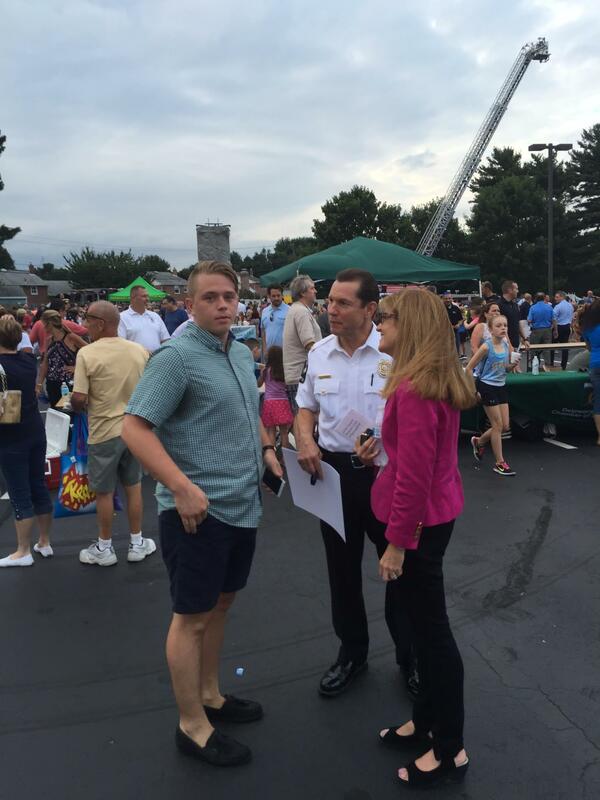 Ms. Schaefer attended National Night Out festivities in Springfield, which makes up a large part of the 165th District. The event is the first Tuesday in August and is designed to raise community-police awareness. It is a tradition in Springfield. So Ms. Schaefer attended, which is fine, and she brought her campaign manager Devin Gosnell, which is fine, and she met Radnor Police Superintendent William Colarulo, which is also fine. But then someone took a photo of the three of them together that Ms. Schaefer is using for her campaign. That is a no no. Radnor prohibits township employees from being used in political campaigns. This is obviously something Ms. Schaefer did. As political sins go, it is a minor one. It’s not as though she sold our uranium to the Russians for personal enrichment, for instance. But the broken window theory applies to politics too. When small crimes are ignored big ones follow. If Ms. Schaefer had a photograph taken of herself with a police officer from another township, there would be no controversy. That she chose an official answerable to herself shows indifference to the law or, at best, blind stupidity. Author BillLawrencePosted on August 18, 2016 August 18, 2016 Categories Election 2016 165th District2 Comments on Elaine Schaefer Broken Window Politics.